Johnny Martin runs for 44-yard TD in Highland’s 30-20 win over Winslow Twp. Johnny Martin powered into the end zone, dropped the football and took a knee. One teammate slapped his back and walked away. Another pounded his chest and walked away. Another tapped his helmet and walked away. Highland's sensational sophomore running back stayed down for more than 10 seconds, finally rising and pointing to the sky. "That was for my cousin," Martin said after Highland's 30-20 victory over Winslow Township in a West Jersey Football League Liberty Division clash of Top 25 teams. Highland sophomore Johnny Martin dedicated the game to his cousin, who was killed Wednesday night. Martin played one of the best games of his career with a heavy heart. He took the field less than 48 hours after the death of his cousin, William Henry, a 21-year-old who was shot and killed in Blackwood on Wednesday night. "He was sobbing on the sideline," Highland coach Brian Leary said. "He's such a great kid, such a hard worker, you hate to see him go through anything like this. "But he showed his character in the way he went out and played tonight." Martin carried the football 37 times for 240 yards and three touchdowns. He scored on runs of 44, 3 and 56 yards. He also returned a kickoff 65 yards to set up Highland's first touchdown. Sophomore Johnny Martin ran 37 times for 240 yards and three touchdowns in Highland’s win over Winslow Twp. "It motivated me to try to go out and play for my cousin," Martin said. "He was my cousin but he was like a brother to me." Martin's hard running, some strong blocking by Highland's offensive line and great work by the Tartans' defense paved the way to a statement victory on a warm, clear night. Highland improved to 4-0 for the first time since 1989. The Tartans, the No. 18 team in the Inquirer's Top 25, face No. 8 Timber Creek, a school-district rival on Friday. "We're going to shock South Jersey this year," Martin said. 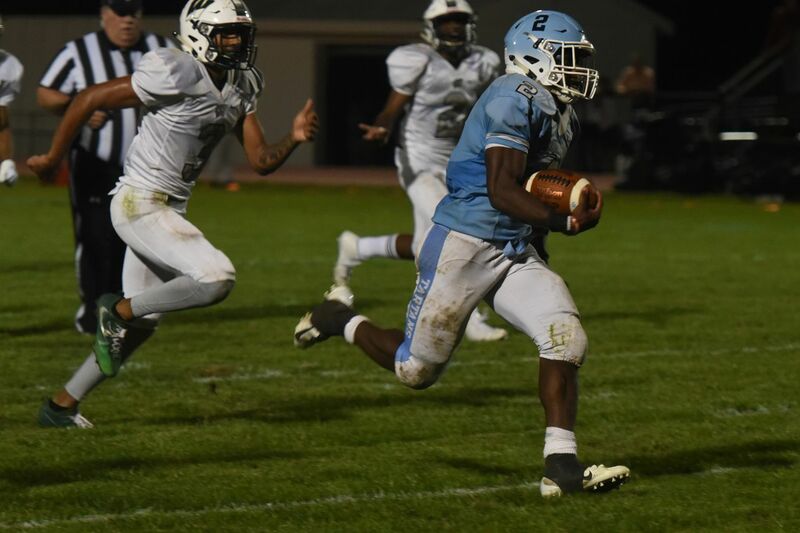 Senior ends Dahmir Barfield and Javon Randall led Highland's defense, which recorded six sacks of Winslow Township quarterback Prince-Dru Bey. Barfield stamped an exclamation point on the defensive performance with a sack on Winslow Township's final play. Junior linebackers Brad Small, who had two sacks, and Oyame Adoga, who forced a fumble, also were defensive standouts for the Tartans. Jayden Brown caught a pair of touchdown passes for 17th-ranked Winslow Township (2-2). The Eagles have played all four games against team that were ranked in the Top 25 at the time. Martin ran hard behind a powerful offensive line. On Martin's 44-yard touchdown run in the second quarter, sophomore left tackle Winston Jordan pulled across the formation and delivered a kick-out block to spring his classmate. Martin has scholarship offers from Baylor, Temple and Rutgers. He is regarded as one of the state's top prospects in the class of 2021. Martin showed both speed and strength. He ran away from defenders on the two long touchdowns, but also lowered his shoulder and powered for inside yardage on several occasions. Leary said he talked with Martin about sitting out the game after learning of his cousin's death. "He was like, 'No way,'" Leary said. "He wanted to honor him and as a football player, this is how you honor him." Martin said playing the game was an escape for him. "I had a hard time in school all day," Martin said. "I just wanted to get out here and play football for him. This was for him."